It was damp and overcast along the windswept Indianapolis Motor Speedway when the final installment of the 2017 Red Bull Air Races got underway. For nine months, 14 highly-skilled pilots competed at “tracks” across the globe; wowing audiences by threading their ultralight machinery through 25-metre high, air inflated pylons and beneath unforgiving bridges in a race against the clock, which some have described as the most challenging aerial races ever witnessed. I was angry at myself for not getting into this sport sooner. Air races are woven into the historic tapestry of aviation. The first held in Reims, France in August 1909, a month after Louis Blériot captured the imagination of his fellow countrymen, crossing the English Channel by air. Almost as famous for its sponsorship of extreme sport as its energy drink, Red Bull ramped things up several notches in 2003 with the high speed, low altitude Red Bull Air Race World Championship. The series returned to the skies in 2014, after a three-year absence where the Red Bull sports “think tank” fine-tuned the concept with lighter airplanes, standardized engines and propellers, and new rules that brought skill back to the cockpit. The competitive spirit of great air racing pioneers such as Blériot, America’s Glenn Curtiss and Henri Farman now rests with the skilled hands of Japan’s Yoshihide Muroya (2017 world champion), Canada’s Pete McLeod, the youngest rookie to qualify for the Air Bull Air Races, and Nicolas Ivanoff of France an aerobatic master whose team competes under the Hamilton watch banner. Because for almost as long as there have been air races, watchmakers have strapped their brands to the adventurous spirit, precision and romance of flight. “Aviation speaks to everyone,” Sylvain Dolla, chief executive of Hamilton told Wings. Hamilton is a division of the Swiss-based Swatch Group, whose showcase contains 19 watch brands. “Our watches are not only loved by pilots from Air Zematt (Switzerland’s world-renowned air rescue organization) and Canada’s Snowbirds, but also by people who love the look of aviation watches.” Movie pilots too. Dolla points out that Hamilton watches have been featured 450 times on the silver screen. A crossover with the watchmaker’s cinematic branding. This year, Hamilton celebrates its aviation centenary. In a touch of irony, America’s “watch of railroad accuracy” was chosen to be the official timepiece of the first U.S. airmail flights between Washington D.C., Philadelphia and New York. Thus began the transition from “The Railroad Timekeeper of America” to “Timer of the Skies.” By the 1930s, Hamilton timepieces were standard issue for pilots of iconic airlines such as Eastern, TWA and United. Here in Canada, Hamilton relies on a strong ground game to burnish its aviation heritage. The company has built relationships with the Air and Army Cadets, and is the timekeeping sponsor of organizations such as the Air Transport Association of Canada (ATAC) and the Northern Lights Aero Foundation (NLAF). Associations with flight schools beginning with Waterloo Wellington Flight Centre and Pacific Flying Club in Vancouver are also being made. Considered one of France’s top aerobatic pilots, Ivanoff was a latecomer to the sport. As a flight instructor in his native Corsica, he flew an aerobatic airplane for the first time in the 1990s. “It was a revelation. I was angry at myself for not getting into this sport sooner,” he said. Ivanoff compares piloting a raceplane with “painting in the sky.” As brand ambassador, he is in close touch with the Hamilton production department to integrate new functions into the company’s line of pilot watches; the latest, a special edition Khaki Air Race watch to celebrate the Hamilton/Red Bull tie up. Back at Indianapolis, Canada’s McLeod finished third in the championship after the wing of his raceplane clipped (but did not deflate) an air pylon on the windy track. 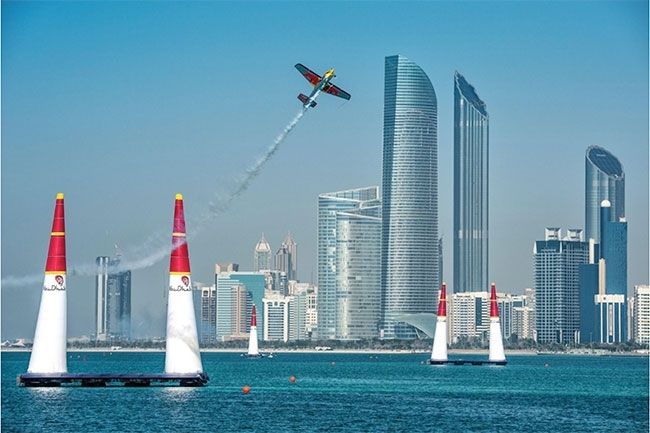 He will be back competing against Ivanoff and the rest when the ultimate air show kicks off in Abu Dhabi this February.